If you’ve got a pontoon, chances are you’ve already purchased your pontoon trailer. After all, a good trailer is an important item for getting around and storing your pontoon safely during the off season. Having developed a close relationship with your pontoon and your trailer, you’ve probably come to realize that good can get even better—and now you’re wanting to add some accessories to the trailer. Back when my family was looking for a new boat and trailer, we did our own research to see what products we could add to improve our overall experience. Here’s a list of useful gadgets and extras which we’ve had come in handy while towing and storing our boat. With the average pontoon boat weight being around 2200 lbs, make sure you don’t purchase a cheap jack that can’t support the weight. The last thing you want is to return to a collapsed jack and your pontoon tipping forward. As one review mentions it gliding easily with a 5000 lb pontoon, this jack is beyond capable. With their patent pending TruTurn 360 system, its casters handle like a breeze. 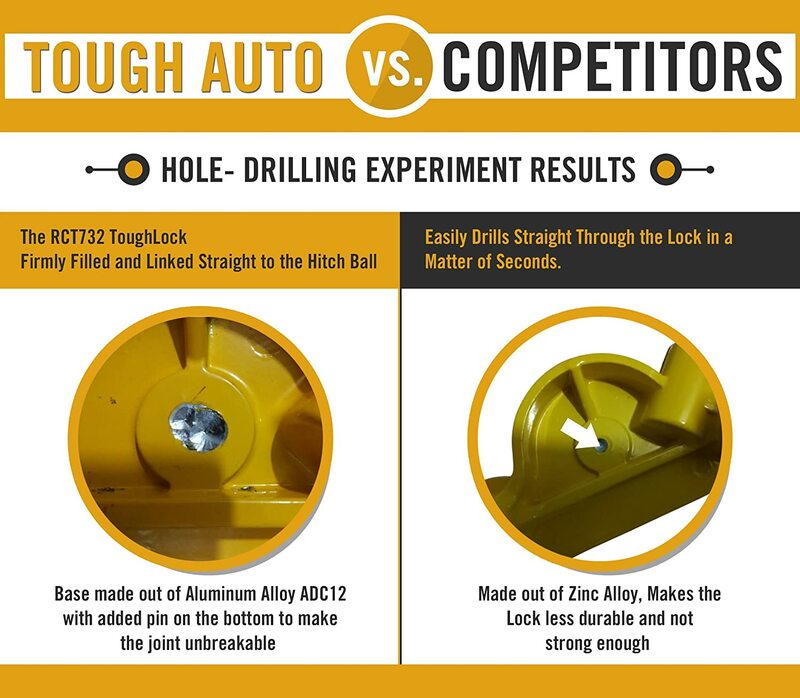 Plus, it raises and lowers 35% faster than the competition with 20% more screw travel than conventional jacks. It also has grease fittings in key locations for easy lubrication and patented inner and outer tube bushings which provide a tight fit and lessen tube drag. And it has a really aesthetically pleasing Premium Sharkskin finish that fights against corrosion. And it features stylized handles with soft touch grips, an 8-inch diameter spoked wheel. This is the same lock I recommend in a previous post related to trailers and hauling. It’s easy to install, mounting and locking onto any type of trailer hitch ball. It has a minimum of 1 ⅞” and maximum of 2″ socket. With a high-quality lock, the trailer is more theft-resistant. Take a look at the manufacturer’s case study photo demonstrating drill outs. It’s made of A36 steel with a chrome finish and safety lock pins made of powder-coated aluminum alloy base. The total of these finishes makes it corrosion-resistant and rust free. To add, I find this a good investment if you travel a lot with your pontoon boat, especially if you do any overnight trips where you have to stopover in a hotel. More than likely you’ll need to unhitch to grab some dinner. And you’ll sleep much better knowing someone can’t make off and steal your precious ‘toon. When you have your pontoon boat set aside or winterized and stored away for the season, this inexpensive wheel dock is perfect for steadying the trailer tongue wheel. It’s also pretty useful if you have soft ground and want to keep the wheel from sinking. In the south and Georgia especially, we have red clay, which is very hard until it rains. You’ll find some wheel docks colored black. I like this particular one for its bright yellow color because even though it calls attention to itself, you’ll never ram your shins or knees into the trailer’s tongue. It’s a small detail but has saved me from bruises on numerous occasions. This Reese Towpower winch is capable of pulling weight up to 1500 lbs. It is easy to install and although it is manual, it unreels smoothly and fast. Thinking of purchasing an electric winch? If so, you should know they’re much slower. Plus, you have to add a high amp power lead and outlet to your vehicle. And—no offense—you’re gonna be that person slowing everyone up at the ramp. And once you have the ‘toon winched most the way, then you still have to winch the remaining foot to reach the end. This Shoreline Marine Winch Strap comes with a utility hook and is made of premium polyester webbing construction. The standard 2” width is just the right fit for the winch mentioned above. Most winches call for a 2” strap to fit, but in reality is roughly 1 ⅞”. But reviews claim that these two fit perfectly together without a problem. It also measures at 20 feet in length. Making local trips, it is common to rely on the trailer hitch just as it comes. But on longer trips, you will need to attach the ball to the hitch using chains for extra security. Although you should check your state’s regulations in regards to safety chains; you could be required to have them at all times. This chain is approximately 36 inches in length and contains two hooks, one on each end. The hooks also have a safety latch which keeps the wrap job from bouncing apart. If you find yourself taking trips and long hauls—always carry a spare! And what better way than to use this spare tire carrier. It means you don’t have to find room in your truck bed or someplace else to store it. It’s just there if you ever run into trouble. This spare tire carrier is universal as it’s both angled and raised to mount to standard and boat trailers. Easily mounts to your trailer’s tongue, if it’s no more than 3” width and 5” height. It can hold a spare weighing up to 100 lbs. And it fits most 4-lug and 5-lug trailer wheels. It has a durable powder-coated finish that resists corrosion as well as zinc plated mounting hardware. Invest in a pair of ratchet straps. Bucking occurs especially on boats with heavy engines as you haul your boat around. Usually, deep pot holes or simply uneven roads can create bucking. A good practice to prevent this and protect your boat is to tie it down. Most well-built trailers will have a front and stern tie downs. Bucking occurs especially on boats with heavy engines as you haul your boat around. Usually, deep pot holes or simply uneven roads can create bucking. Sometimes it can be a real struggle to load your pontoon. You’re tired and just want to call it a day. That’s when guide-ons come in handy. Guide-ons assist you in many ways. They can keep you from loading in too deep of water, especially on steep or uneven landings. With 30″ overall height, these guide-ons are great for large pontoons. In a crowded launch facility, they can help you load faster and safer. This set of pontoon guide-ons are made of heavy-duty 2-½” industrial-grade steel frame with PVC coating. The PVC coating protects your boat’s finish during high winds or rough waves. Bunk trailers are mostly covered in carpet. But you can purchase extra trailer pads, sometimes called “caps.” Trailer pads assist in the loading process, making the ‘toons slide much smoother than carpet. The moisture which carpet retains can in time cause some damage to your ‘toons. Instead, I suggest installing a set of bunk glides. I recommend this Surfix Trailer Bunk Glide kit. Unlike many pads, they offer full bunk support which means they can’t leave marks on the ‘toons in between unevenly spaced pads. It also means you don’t have to worry about measuring and spacing the pads out an equal distance. These glides are also constructed of .45” high-density polyethylene and screw into your bunks with low profile stainless steel pan head screws. And although you may be thinking that white will appear dirtier faster, it has advantages. The white color is also highly visible under water. And it makes any dirt or sand easier to see, which means you can wipe it off before it scratches your ‘toons.